It did not look a million dollars, but what can you expect for 17p? It looked like a challenge to me! One plane type I haven't discussed previously is the infill plane. They are usually very expensive collectors' items and out of my price range. 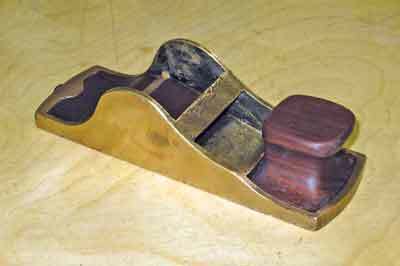 However, my lovely wife found three old planes at a jumble sale for the princely sum of 50p: one was a tatty wooden jack, another was a Stanley Handyman smoother - which got the Workshop Notes electrolysis treatment in WPP 82 - and the last was a poor-quality brass infill plane, probably from the 1920s. As it was in my budget range this somewhat unprepossessing and unlovely item seemed perfect for a makeover. 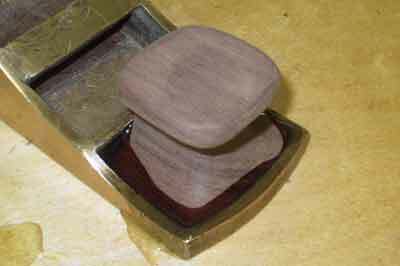 I had a heavy lump of cocobolo (Dalbergia retusa) that was large enough to make all the infills in stock already. I have to say, although it isn't my best work ever, it looks good and the blade is very sharp, being of good steel. Not bad for 50p divided by three - shall we say, 17p? The wooden infill pieces were a mixture of beech (Fagus sylvatica) and pine (Pinus spp.) held in place, apparently, by bitumen. 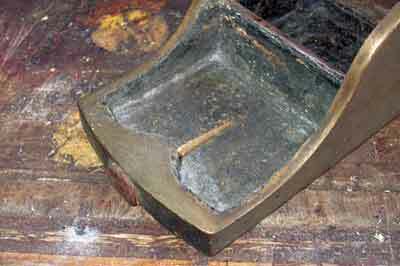 The first job was to use a second-best chisel to lever out the pieces and scrape the metal clean of black stuff. It appeared that after the rear infill had been fitted a hole was then drilled to take the beaten-looking striking cap of the plane at the back. At this point I was debating whether or not it was a good idea to try to remove it for replacement or not. 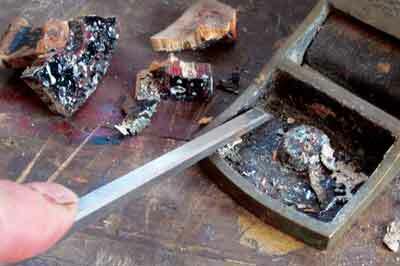 I thought I would try sharpening the old and rather worn down blade. I removed the hammer burr on the top edge using a dry grinder. 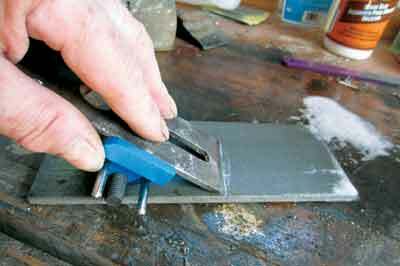 Then I reground the stubby cutting edge and used my diamond stone's 250 and 1,000 grit and then stropped it. It gave a very crisp cutting edge. The sole and sides were flatted with emery paper starting with 250, 400 and 600 grits. These rather soft-metal-bodied planes are usually not very flat. This one wasn't bad; just a little hammer beating was needed to level the sole and sides before completing the sanding. I managed to grip and remove the striking cap of the plane, which, on closer inspection, I found to be threaded. 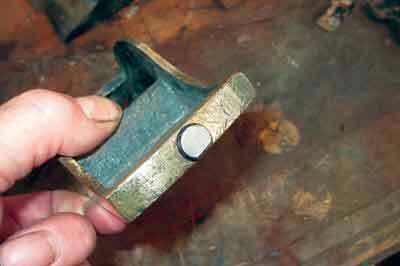 Fortunately I found a suitable nut in my bits box and ground and filed it to the correct size and shape, clearing the sole by filing a flat on it. Initial shaping was done roughly copying the 'footprint' of the original pieces. I used the bandsaw to rough-shape, then a bit of Japanese saw work. 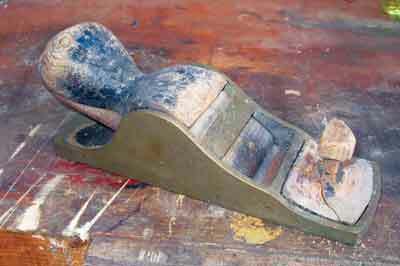 After that, I used a fine-toothed 'hand stitched' musical instrument rasp and plenty of abrasives. Instead of bitumen I used Bondaglass resin and hardener. 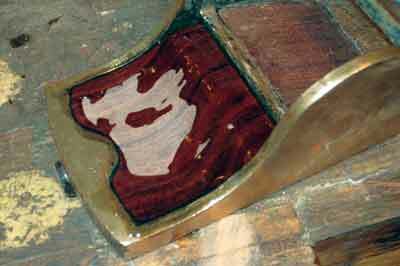 The resin was scraped off with a sharp chisel and a bit more abrasive in order to get it looking how it should. I didn't have a proper notion of how the front knob should look. 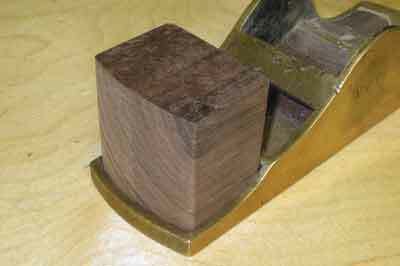 The first step was to shape the block to fit in the recess. Then I pencilled on what seemed an acceptable shape. The knob was going to have a flat top but shaped sides. 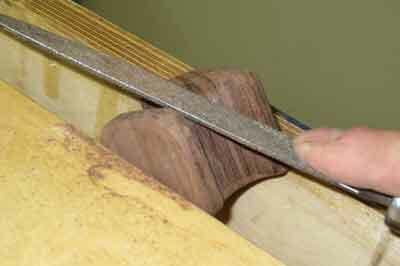 After bandsawing out, the fine rasp was used for rounding the shape. I decided to try Abranet abrasive wrapped around dowel with adhesive hook-and-loop to hold it on. This proved to be a really good way to get an even, smooth finish. When it eventually fitted and I was happy with the fit more Bondaglass resin was mixed up and dripped in and the knob pressed in place and left to set. At this stage all I could do was to wait, as the resin needs to be left overnight to fully cure. In the morning, the overspill was carefully chipped and scraped off, with just a bit more abrading needed to complete it. As you can see from the photo here, the plane was now beginning to look quite pleasing. 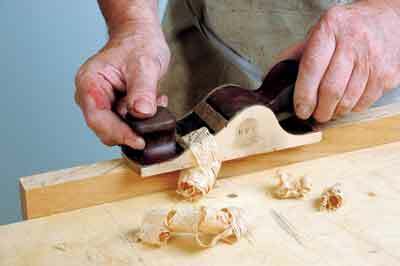 The next job was to create the wedge that holds the blade and forms the palm grip at the back. I drew around the old piece and then gradually produced the rather complicated shape using the techniques previously described. The first job was to get the underside completely flat. 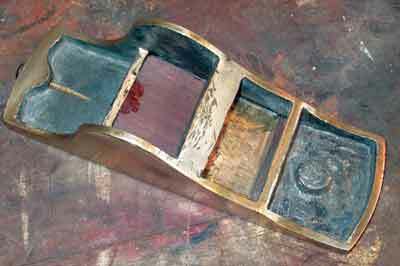 The wedge angle was quite important for it to grip in place and the step cut-out needed to stop short of the brass bridge holding it in. When completed and the blade fitted, it rocked. The blade was out of shape and needed some hammer-beating flat. 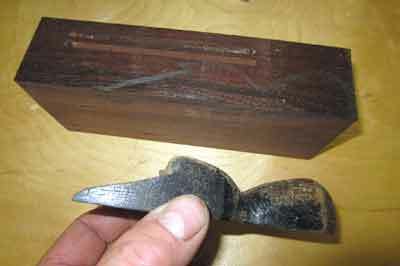 When I got the blade set properly, I was rather shocked that this little old block plane cut perfectly straight away. I rather like it now!